(Not) Just Another Mom of Twins: Stuffed Shells...My Mom Can Cook! Assignment: Last week we talking about mom's WORST homemade meals. This week describe a meal your Mom cooked that you LOVED eating growing up. My mom can cook. Yes. She. Can. I refuse to eat Pate Chinois but not because she can't cook it but because she made me smell my feet at the dinner table. Confused? You must have missed last weeks post. LMAO! Not MY MOM'S but you get the picture! This week, I really struggled with picking only one meal that my mom use to cook that I LOVED to eat. After much contemplation and analyzing all the "pros n' cons"...I decided on stuffed shells. YUM! YUM! Long before the convenience of being able to purchase shredded cheese in a bag, my main responsibility was to grate (shred) a pound of mozzarella and a pound of cheddar cheese...by hand. At the time I thought, "WoW! My mom must REALLY TRUST me to allow me to have such an important job (shredded cheese is over 50% of the recipe)!" However, now I know that it was the worst job of the recipe but back then I felt like a real sous chef. LOL! Chances are, if you are coming to my house for a dinner party I'll be serving you Chicken Parmesan, Authentic Cesar Salad and Stuffed Shells. For dessert, Divito's Coffee Cake. Chances are, you will ask for the recipe so here it is...enjoy! Preheat oven to 350 degrees. Mix Cheeses, egg, garlic, salt n' pepper and enough bread crumbs so the mixture is not too mushie. Stuff each cooked shell with a tablespoon (or so) of cheese mixture. 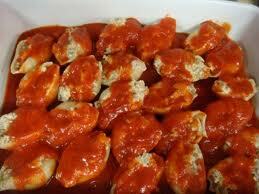 Grease a 9x13 baking dish and pour 1/2 of the spaghetti sauce on the bottom and place stuffed shells on top. Pour the remaining spaghetti sauce over top. Cover with foil and bake for 45 mins to 1 hour. YUMMMY! Oh, yum. I'm definitely going to try this. Cooking together really is a bonding experience. How smart of your mom to include you - AND to get you to doing all the grating! That looks so good! I'd completely forgot about stuffed shells, thanks for the reminder and recipe! I was always the designated cheese grater, too! This looks so good. I am silently cursing my husband's gluten intolerance right now. Yup, stuffed shells are a win. What's not to like?